Solve your thinning hair problem in 10 seconds! Specially processed natural fiber which adheres to your thinning hair with static electricity and adds volume to your existing hair. 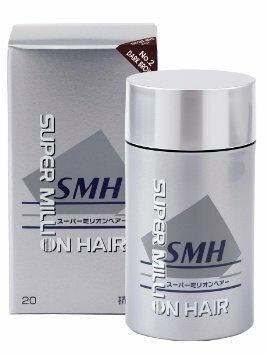 Super Million Hair consists of fine particles of artificial hair which are sprinkled on your natural thinning hair to give the impression of a thicker and fuller head of hair. After the fibres have been placed on the thinning area, they are then held in place by a specially formulated mist which acts as a bonding agent interlocking the fibres to the hair. Super Million Hair is used by men and women of all ages. Super Million Concealer is easy to apply and looks and feels completely natural. Super Million Hair is not a cure for baldness, but it will make your head look as if you have got a head full of hair and it is completely unnoticeable. The No. 1 brand in the world in the same category. Super Million Hair is a specially produced artificial hair cut into small sections that adhere to your existing hair with static electricity and conceals thinning hair. Super Million concealer manufacturer in Japan has been studying about thinning hair which is one of the most essential parts of beauty since the establishment of the company(1973). Everybody wants to look young and beautiful even when they get older. Your hairstyle can change your face, clothes, and mind. In addition, you feel yourself a different person with a hairstyle you like. But you have to keep it in mind that your hair gets gray and falls off with your age. Super Million Hair has spent years to answer this problem since 1973 and succeeded in providing the products that satisfy the customers. 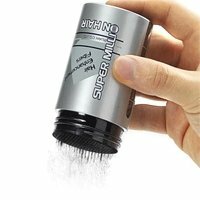 You apply Super Million Hair by simply holding the custom container over your thinning area, and sprinkle it gently. In seconds, thousands of tiny color matched hair fibers will intertwine with your own hair. Available in a shade that will match the colour of your hair.